European Office is looking FOR YOU! Kwan Um School of Zen / Europe, guarding a thousand-year-old tradition, is looking for Experts and Experimenters of all fields, who would like to explore together the challenges of modern times in order to transmit the Buddha’s teaching. “Trying is better than Zen Master, better than Buddha, better than God”. If you want the tradition to continue in the modern world, tell us how can we help each other by filling the survey. Share your skills, ideas and projects. 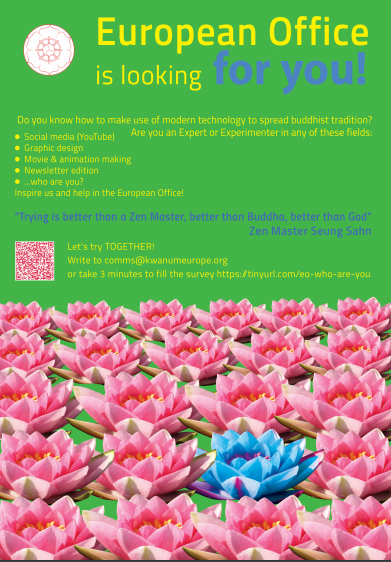 Dear Abbots and Group Leaders, please help us spread the word and download this Talents – poster A4 to hang it in your Zen Center, encouraging each and every member of our Sangha to fill our survey. It will help us to partially map the demographic features of our Sangha and learn more about each other. https://www.kwanumeurope.org/wp-content/uploads/2017/04/unnamed.png 276 726 Gil https://www.kwanumeurope.org/wp-content/uploads/2016/05/logo2.png Gil2017-04-18 04:55:032018-12-30 08:48:38European Office is looking FOR YOU!